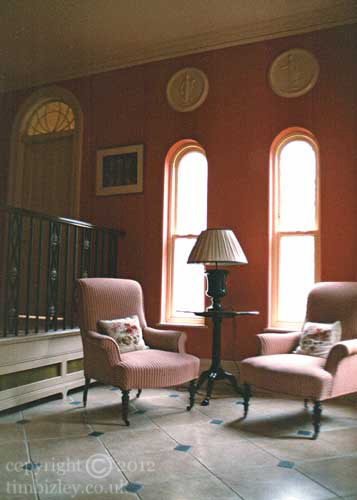 Traditional stippling glaze and wipe work can be used to bring out the definition of architectural elements, frequently the dimensional elements of plaster work or fitted units and furniture. The balustrade and rosettes were given a faux bronze paint effect and a patina to simulate old bronze. Faux bronze is a paint effect that can be applied to most substrates to give the impression of metal work. Both effects are useful for the creation of the historic interior, giving a restrained but majestic feel of some depth.